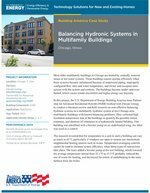 Most older multifamily buildings in Chicago are heated by centrally metered steam or hot water systems. These buildings cannot operate effciently when these systems become imbalanced. The buildings become under­ and over­ heated, which causes tenant discomfort and higher energy use intensity.